Elephant wandered in the late-afternoon woods and stopped at a little shaded pool for a drink of water. Later, he foraged some and found the very stone that Butterfly was exploring and Caterpillar was guarding. He pried it gently from the soil and lifted it right up to his eye for a closer look, turning it in the fingers of his trunk. He carried it to where the clearing met the wide savannah. There, the sun was brighter and the grass was turning gold. He turned it and turned it, then held it up to his eye again. A line, very slightly bowed, was cut into the side that had been laying face down—for how long, he couldn’t guess. It was well worn, but still looked as though it was part of something bigger. Just a cut, mind you, but one your eye followed to the memory of a line that was much longer—perhaps curving into a shape and then arcing around again to complete itself. Elephant glanced out at the open plain and lowered the stone, turning it a few more times. He noticed an elephant-foot-sized bit of granite about as high as his knee, and he put it down there. It might be a good place to come and find the little stone again, if he felt inclined to look for it. Vague movements and a cloud of dust near the low, dry hills in the distance had caught his attention. Elephant went to investigate. 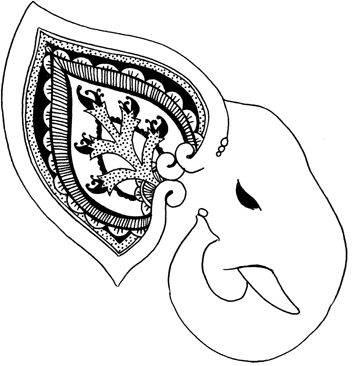 This entry was posted in The Story and tagged elephant, mysteries, noprint, story, the little stone. Bookmark the permalink.